Apple’s latest operating system, iOS 9.2, is basically like getting a new phone — but first, you’ll need at least 1.3 GB of free space to install the new software. If you’ve been putting off the upgrade because you’re receiving the dreaded “Not Enough Storage” message, these are the solutions you are seeking. Our smartphones are the center of our digital universe, and they hold lots of data: text messages, photos, browsing history, etc. If your iPhone’s storage is at capacity, then follow these simple steps to make room for more data. Find out what your problem areas are before deciding what to delete. 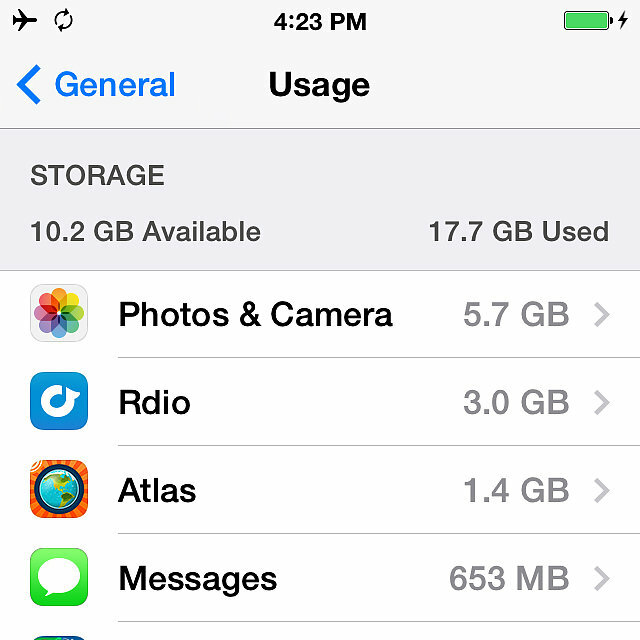 On the iPhone, head to Settings General Usage to view how many gigabytes you have available. Apps will be listed by how much storage they occupy — Photos & Camera is likely to be at the top of this list. On a Mac or PC, plug the iPhone into a computer and open iTunes to click on the phone icon and view storage broken down by Apps,TV Show, Music, Movies, Photos, and Other. Hover over one of these categories with your mouse to view details. “Other” represents settings, calendar events, notes, browser cache, email, email attachments, and more nonmedia data. If Other makes up an overwhelming amount of iPhone storage, then there may be an issue with corrupted data. If you’ve tried deleting all of our suggestions and there is still lots of Other storage, then consider restoring your iPhone. Make sure you have the latest version of iTunes, have backed up the device, and have synced content with your computer. Connect the iPhone to your computer, and in the Summary section under the phone icon, click on Restore iPhone. This returns the iPhone back to factory settings. On the iPhone, do this in your camera roll. On the Mac, connect your iPhone and open Image Capture (default on all Apple computers). Select photos to delete, and select multiple images by holding down the command key while you click on the photos. Nip the full-memory problem in the bud next time around. Since photos are typically the biggest problem, download the Google Photos app, which compresses, backs up, and stores unlimited high-quality photos and videos for free, meaning you can delete them from your Camera Roll. Reduce what is synced to your phone. Consider syncing selected playlists or genres rather than the entire music library, and deleting podcasts, movies, and TV shows after you’ve finished watching them.